Water conservation was most carefully analyzed in the way the site was developed. The building was sited near a man-made pond. The pond is used for site stormwater management, both for the nearby existing plant and the new facility. Rooftop rainwater is also directed to the pond which provides back-up fire protection supply. The existing rural landscape was not altered by the addition of large amounts of landscaping which would require irrigation. Hardy foundation evergreens, which require less water were planted around the building. However, should irrigation be required at some point the pond can be utilized. 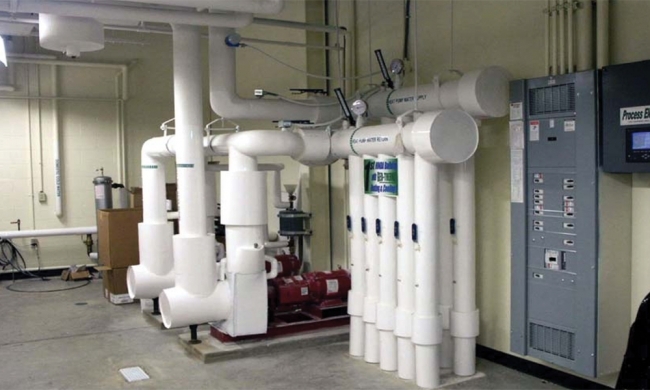 To conserve water in the day-to-day use of the building itself low flow plumbing fixtures were installed. Instead of adding additional plumbing for employee locker rooms and cafeterias, the employees use those existing in the main plant. Materials were chosen that reduce life cycle environmental impact, promote employee wellness, provide high energy performance, are durable, and have low maintenance requirements. Twenty-five percent of the materials were from suppliers in a 500-mile radius of the facility thus reducing transportation costs. Recycled materials were used including the following: rubber flooring, raised computer flooring, aluminum skylight frames, summitville floor tile, ceiling tiles, drywall, metal studs and insulation, asphalt paving, "grand cem" cement in concrete, particle board, laminate, phenolic backer, water closet and urinal carriers, copper pipe & fittings, pvc pipe and fittings, sheetmetal ductwork, and insulation. There were $217,111.00 in green materials utilized in construction or approximately 27% of the total material costs. Sitework also recycled by utilizing an existing stockpile of leftover clay from another project as engineered fill. Many trees were relocated to optimum locating around the building. To promote recycling during occupancy the facility has provided 7 different recycling areas for the employees with categories such as: oil filters, aluminum, shredded paper, plastic, oil, anti-freeze, gloves/mats/mopheads, rags, etc.